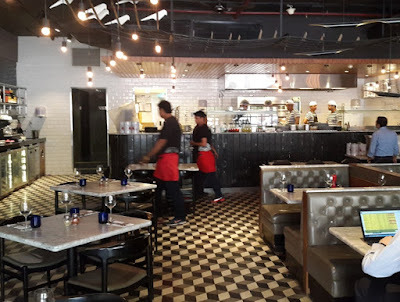 Grubzon - A Gourmet Voyage: Pizza Express - Powai, Mumbai. Pizza Express - Powai, Mumbai. We climbed down into the abyss, walked our course and easily climbed back on the other side. It was so easy compared to our ordeal before. We had found the place to be larger, deeper and spookier in the dark. Firsty fashioned a torch out of a piece of wood we broke from an old book rack. However, we faced a new challenge as we emerged from the structure. The island's remaining cowards who had no courage to explore the mansion on their own had surrounded us. PizzaExpress(without the space) needs no introduction. Its a casual dining pizza chain located virtually all across the globe. The brand is quite a big player in Mumbai itself where they have four outlets in four different food districts. The first thing that I noticed upon my entry was its dual styled ambiance - bird cutouts on one side and bird shaped lights on the other. PizzaExpress restaurants use a different theme in every outlet. Since this outlet was located in Powai, they used a lake and birds motif. One side appeared like a casual dining Pizzeria while the other side felt like a fine dine. Ginger Fresca was a Ginger flavored fizzy drink that was cold, refreshing and quite comforting to the throat. Its flavor was dominated by Ginger ale with a hint of mint. 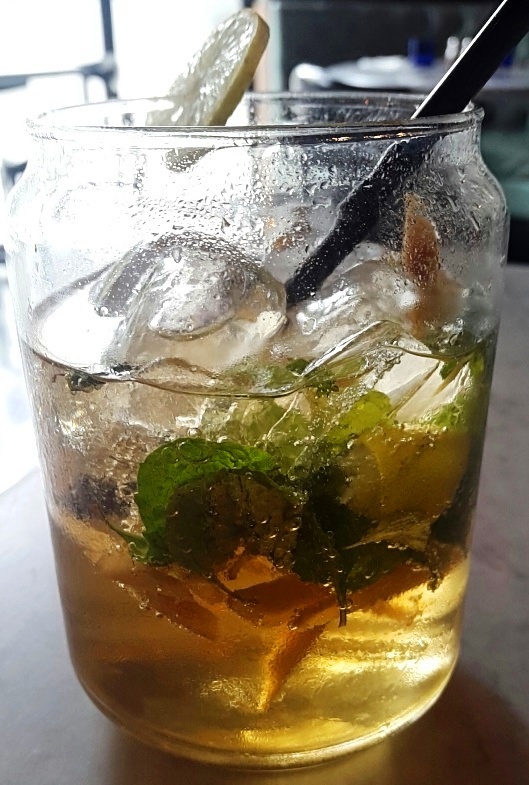 A great choice if you are tired of the same old Mojitos and soft drinks. Gamberetti Piccante was a healthy prawn based dish made in a spicy passata sauce. This passata is said to be sourced from the famed Greci family in Italy. The flavor was mildly spicy and savory. 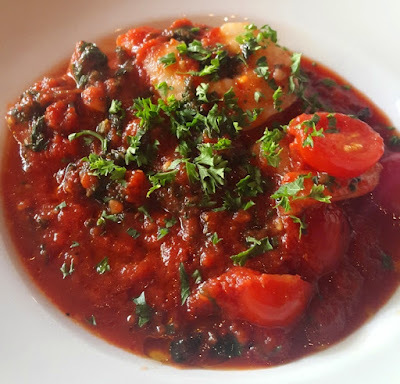 The Tomato passata dominated the flavor while the spinach and Italian herbs provided taste depth to the dish. The rustic home food flavor and the flamboyant red color concerted well together and made it quite a great choice for an appetizer. Island Rogue : You may have beaten Cuvo but he was nothing more than a low level barnacle. I am the great Pirate Lord Roni and you will hand over the chest that you found inside that building to me. Captain : Fancy title kiddo. Was the great Pirate Lord too scared to enter the dangerous structure himself? Sorry buddy, finders keepers. Roni : Enough! My men have surrounded you. You stand no chance. Captain(chuckles) : My, my we have quite the situation then. Etna Pizza is named after the famous Sicilian volcano. Its texture appeared rough due to less cheese and its color was dominated by dry cured ham and sausages giving it an appearance like an active volcano. I thought the pizza appeared artistic. It was almost as if someone baked it in a Prisma Oven ha. The flavor was meaty, savory and the rough texture extended to the flavor as well. 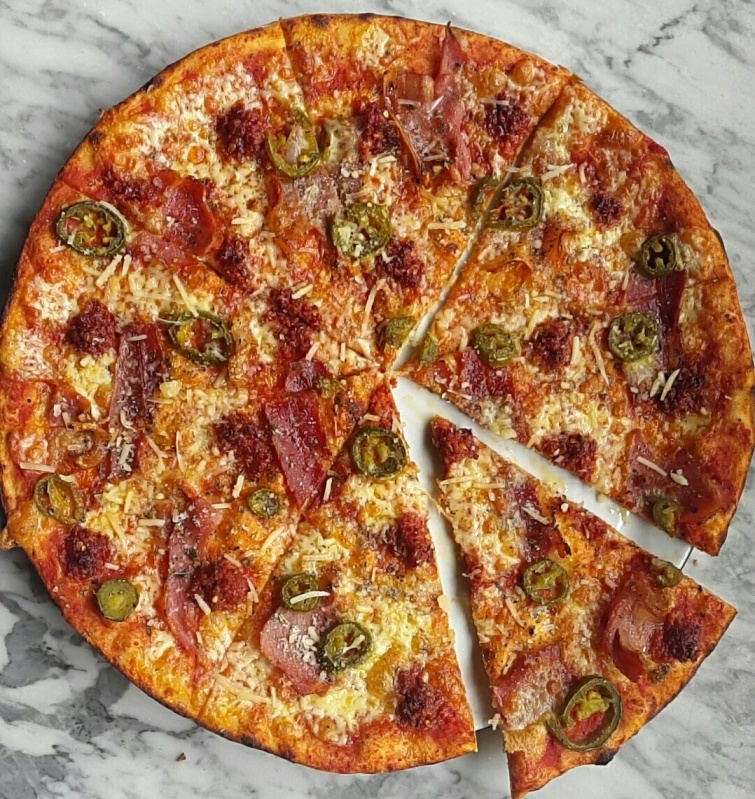 Its a great pizza to have if you enjoy good meat but if you are a cheese addict then there are other choices on the menu. The Jalapenos compliment the ham well. First Mate : Stop messing around mate, just blow them. Captain : Aww shucks, I was having fun ya know. Roni : I wait no more. Get them Boys. First Mate : Wow they blew further than a pro Golfers Tee shot. PizzaExpress' Cheesecake is the classical and the near perfect rendition of the Baked Philadelphia cheesecake. 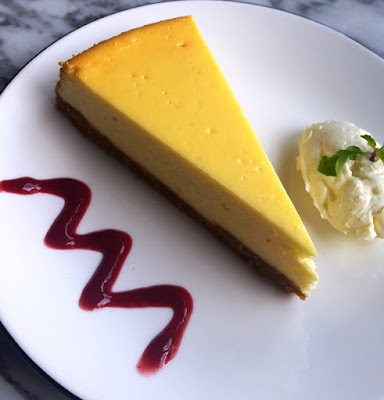 The flavor is amazing and its definitely one of the best cheesecakes in India. The only thing not traditional about it is that PizzaExpress uses McVitties Digestive biscuit crumbs instead of Graham crackers for the base. The latter tend to be more brittle. 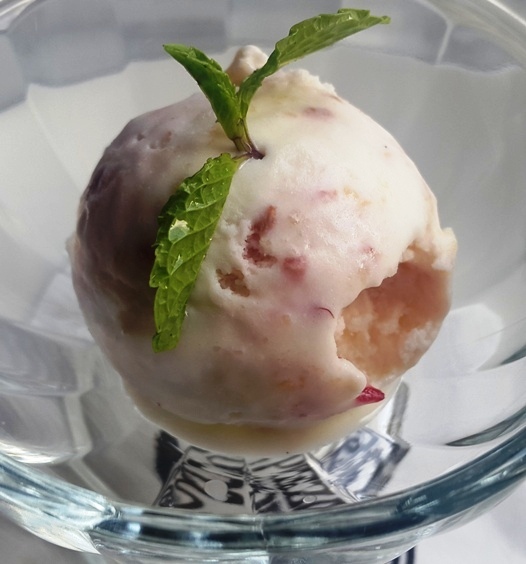 Raspberry Cheesecake Gelato is a recent addition to the PizzaExpress menu. Its a decent emulation of a cheesecake flavored ice cream. Unlike the versions found in major ice cream outlets in town, this Gelato truly tastes like a liquid cheesecake with a tarty raspberry flavor. While I did enjoy the Cheesecake above, I must admit that this was the better of the two desserts. PizzaExpress serves great pizza though I do feel its pricing is on the higher side. However, they use imported ingredients for a truly Italian pizza experience so that affects things. The service was excellent. My server knew every detail of every pizza on the menu, the places from where the ingredients were sourced and answered everything I threw at him. His conduct was very professional. This is the kind of service one desires at any place. I love Pizzas, its one of me favorite things in the food world. And I love going to PizzaExpress whenever I can. Its a shame that there isn't a PE outlet in my neighborhood otherwise I would probably be giving them business at least once a week. But yes, if you live in Mumbai and if you love Pizzas - Do visit Pizza Express. Captain : We got this chest but still don't have a clue to the next spot. Navigator : The chests inscription's resemble our map greatly. Could it be? Captain : (Places the map on the chest) Wow the inscription is a near identical copy except for this bulge here. Navigator : That bulge happens to be Faraway island. The worst place in all seas. If I had to hide a legendary artifact. It would be there. Captain : Makes sense. I have a good feeling about the worst place on the sea. Set course to Faraway Island. Veranda - Bandra West, Mumbai.